Trolls are back and these are not the under the bridge, scary kind. The new animated Dreamworks movie is a happy, song filled movie that the kids are lapping up! A local mum of twins asked me to throw some ideas together for her daughter’s 7th birthday party. She wanted smart ways to style her Trolls party that were not the garish and furry kind! So here are some gorgeous ways to style your kid’s a magical trolls birthday party. What sprang to mind when given Trolls as a theme was woodlands, toadstools, fairies and flowers. 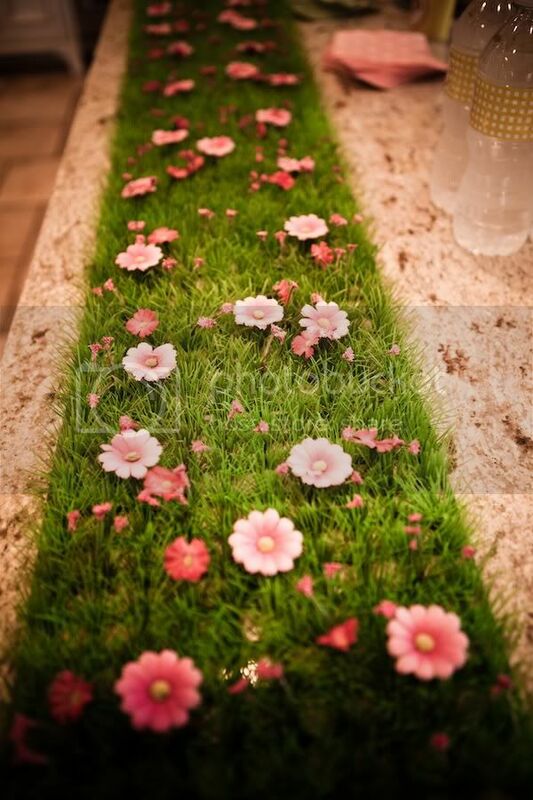 Get hold of a moss table runner and decorate with flowers, confetti and of course little trolls. Turn your attention to your spare terracotta pots, fill with wild flowers, lavender and any woodland fauna you may find. Have a branch centerpeice straight from the woods or make you own with added felt leaves for the hairy theme that is Trolls! Earthy, healthy party snacks for your ravenous kids to consume! Keep things bite sized to avoid half eaten morsals. Cheese twists in a terracota pot or wicker basket. Add a variety of different coloured hummus for dipping. Mini bugers are fun and popular. Change the pom pom topper for a hairy or feathery one to hint at the theme! Corn on the cob is colourful and sweet. Serve them hot with butter on an easy to grab skewer. Woodland inspired toffee apples dipped in nuts with a twig to hold on to… they’ll love this! A Trolls party calls for a colourful affair so take a look as these sweet must haves! Organic edible flower bark with tasty coconut. Click the pic to check out the recipe. Tree stump inspired fudge.. wow. Bright and beautiful butter frosted pom pom flowers. On top of cupcakes or biscuits, the choice is yours. Easy flower pretzel bites. Smarties can go a long way. These sprang out as the perfect Trolls inspired cakes. Click on the photos to find out more. Ombre meringue drops flowing over this simple two tier cake. Add extra flowers for more colour. Rainbow layer cake crafted with stunning sugar flowers. Not for the faint hearted! Custom made Poppy cake, the leading lady in Trolls. Incredible! Place these free activity books on the table or pop them in your guest’s party bags. If you’d like to download and print these Trolls inspired activity books all you need to do is click on the picture. Included is – Word Search, Word Scramble, Trolls Maze and the answers. Upgrade your theme with these creative DIYs. Thank you to all the blog & website owners who agreed to the use of their images in this article.